Samsung's 2010 3D-ready TVs can only deliver a 3D viewing experience if you're wearing Samsung's 3D Active Shutter Glasses. These glasses have special liquid crystal lenses which lighten and darken in precise coordination with the 3D content displayed on the TV screen. Each eye sees a full 1080p image, a left or right version, which is necessary to create the 3D effect. Combine the TV and glasses with a 3D video source and you're ready to enjoy a lifelike three-dimensional viewing experience in the comfort of your home. Samsung's 3D glasses are completely wireless. They communicate wirelessly with the 3D emitter built into all 3D-ready Samsung HDTVs, and they're powered by a small built-in battery. These SSG-2100AB glasses are sized to fit most adults. 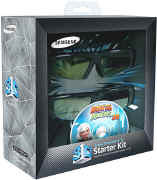 Overview: The Samsung 3D Active Glasses (SSG-2100AB) includes one pair of 3D active glasses, a lithium coin-type battery (CR2025 3V), and a soft carrying pouch. Samsung's battery powered 3D active glasses allow you to experience 3D entertainment from a Samsung 3D HDTV and a Samsung 3D Blu-ray player (with 3D movie), or satellite provider broadcasting in 3D. 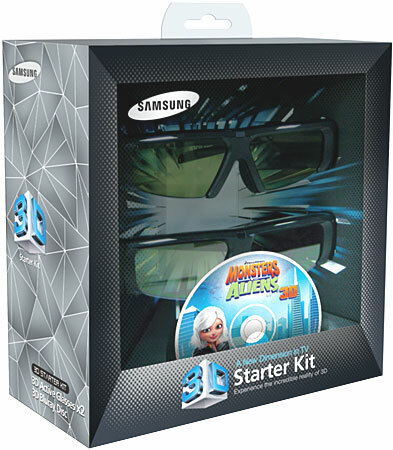 Compatibility: The Samsung 3D Active Glasses (SSG-2100AB) are compatible with 2010-up Samsung 3D-ready HDTVs. You must also have a 3D-ready Blu-ray player with 3D content, or a satellite/cable provider broadcasting in 3D. Note: Not compatible with previous Samsung TV's which featured a 3D Sync IR output. For those TVs please use our DLP Shutter glasses. 3D Active Technology: When you put the 3D glasses on and look at the TV screen, this active 3D technology first blocks the left and then the right lens (faster than the blink of an eye, so you don't even notice), displaying the screen's images separately to each eye. This "staggered" effect provides far more lifelike 3D images, than previous technologies. Compatible with select 2010 Samsung models: Including C7000, C8000 and C9000 series LED-LCD HDTVs, C750 series LCD HDTV, C7000 and C8000 series plasma HDTVs and BD-C6900 Blu-ray players. Operation: The 3D active glasses operate off of a single CR2025 3V lithium coin-type battery. The battery compartment is on the inner left-hand side of the glasses. There is a power button on top of the right-hand side of the glasses. The power button features a red LED indicator. The indicator blinks for 3 seconds when turned "On", and blinks three times when turned "Off". If you are watching 3D in a room lit by a light magnetic fluorescent lamp (50Hz or 60Hz), you may see flickering on the 3D glasses. If this occurs, please turn off the light. If you change the channel or input more when watching 3D, the TV will change to 2D from 3D automatically. When the TV changes from 3D to 2D the glasses will automatically turned off. If the Emitter becomes disconnected to due to either a change in the angle or viewing distance, the 3D glasses turn off automatically after 2 minutes. This this case, the red LED blinks 3x. 3D glass may not work properly due to noise interference from other electric devices under specific condition. If you just bought a new Samsung 3D enabled TV set and 3D enabled 3D Blu-Ray player this is for you! Two glasses and the 3D Blu-Ray movie Monsters vs. Aliens! One 3D Blu-ray movie title "Monsters vs. Aliens"